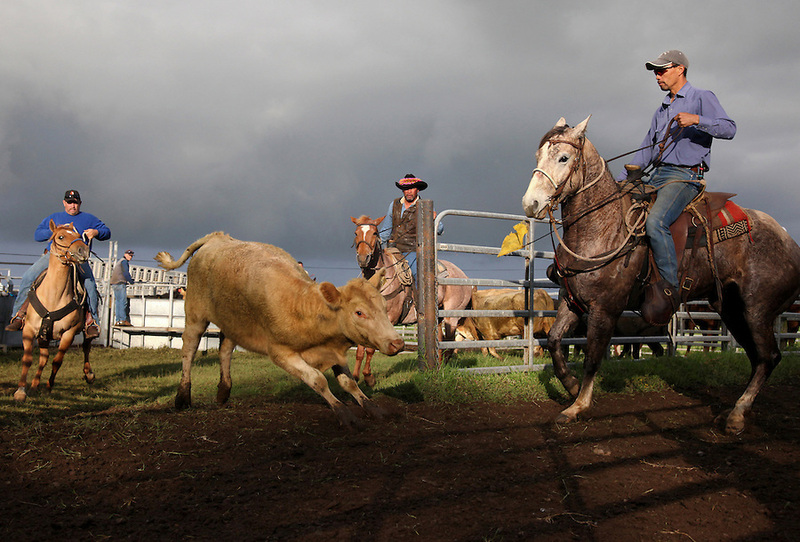 From left, Timmy Farrera, Bernard Ho'opai and Wayne Tachera--all cowboys from different ranches--work together to separate calves from their mothers before branding, innoculating, tagging and in the case of males, castrating them at Ponoholo Ranch on the Big Island of Hawaii. The cowboys gather before sunrise and often communicate with each other using Hawaiian words. The paniolo culture is partly responsible for preserving the Hawaiian language during a time when missionaries were trying to eradicate it. Because cowboys gangs were predominantly Hawaiian but also included men from diverse ethnic backgrounds--Chinese, Filipinno, Caucasian, Portuguese, Puerta-Rican and Korean--Hawaiian became the unifying language.